Visitor Wonders How to Stop Crate Soiling? Crate soiling can be a hard problem to correct. 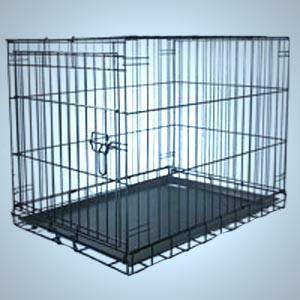 Do you have any idea if your new pet was crate trained before she came to you? Dogs that are trained to accept temporary confinement as puppies usually refrain from soiling the crate unless absolutely necessary. That said, here are a few things you can do to try to remedy the situation. Make sure to exercise her right before you put her in the crate. This will eliminate any immediate physical need to potty, but be aware that she can force herself to go if she feels upset about being crated. Try not to confine her for very long periods. You might want to try putting her in the crate for ten minute periods while you're at home with her. This will help her adjust to the idea of spending time on her own, and may help the overall situation. Work diligently on house breaking her so you won't need to actually crate her. You may find you can simply use a baby gate to confine her to the kitchen or bathroom while you're gone.